One of the age-old music trivia questions is, which group’s name in Greek means ‘from the womb?’ Del Amitri right? Wrong! 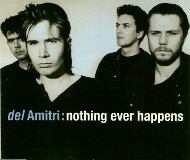 Find out more and read all about their 1990 hit Nothing Ever Happens. The band were formed in 1983 by former chef Justin Currie, an appropriate name for a chef, in Glasgow. The original line up comprised, singer/bass player Currie, guitarist Iain Harvie, rhythm guitarist Bryan Tolland and drummer Paul Tyagi. They were compared, at the time, to Orange Juice, but Currie’s songwriting let them carve a niche of their own. Justin explained in an interview with Song Writing magazine how he got into music, “I started by listening to The Beatles and pop music from quite a young age. My dad was a classical musician, but that was all a bit too intellectual for me. I really got into MOR stuff when I was eight or nine years old. My parents had a stereo in the 1970s and for some reason they bought Gilbert O’Sullivan’s first two albums, which I absolutely adored, and still do. We had a piano in the house so I learned Let It Be and Imagine on the piano when I was about 12 or 13, then one of my dad’s mates stored a bunch of stuff in our house and he had a classical guitar, so I started learning that. But at that point I was into punk rock, so I played basslines on the bottom two strings and started writing little punk songs on it.” A friend of Justin’s started his own record label and they recorded one song. They farmed a few copies around and it make Single of the Week in Sounds which, in turn, led to a John Peel session on Radio 1. Their debut single, Sense of Sickness and its eponymous parent album, both released in 1985, failed to make an impact. Further singles; Stick and Stones Girl and Hammering Heart did likewise. They took a little break and Currie spent time honing his songwriting skills. In 1988 the line-up changed when Currie and Harvie – the only two original members to remain throughout – brought in Andy Alston on keyboards and various sessions players including violin, cello and accordion, they also signed a record deal with the A&M label. The song tells the story of the mundane, boring life of your average person finishing their day. The secretaries who type all day and are glad to switch off their machines. Janitors, or caretakers, as we call them, going around locking up buildings just so a night security guard can keep an eye on them all night. Pub landlords happy to call ‘time’ so people can leave and then having to kick the last few stragglers out at the end of a night. Then how everything is silent at night. CCTV’s in department stores that constantly record nothing happening. He even suggests that martians could land in the car park and no one would bat an eyelid. On the news, we hear terrible stories but just carry on as we do. Then the next day, the same thing happens. In other words, nothing ever happens, nothing really different happens and so the world remains as it did before. Throughout the 90s, they released 15 more singles, all of which made the top 40, the highest being 1998s Don’t Come Home Too Soon, a song Justin wrote whilst he was bored on tour. He said of it, “I wrote that song about Scotland going to the World Cup which I disguised as a love song. People who heard it said I should send it to the Scottish Football Association, which I did.” Their last hit was appropriately called Just Before You Leave which reached number 37 in 2002. The band have never actually split up but Harvie began concentrating on production and Currie began a solo career. He has released four albums, What is Love For in 2007 and The Great War in 2010. Both failed to make the chart, but in 2013, Lower Reaches did just that, when it made number 46 and just last month came his latest, This Is My Kingdom Now spent just one week at number 54.